This cemetery had a name change. It is now called Westminster Memorial Park. The records at this cemetery are not digitalized. In order to find a location you need to fill out a request slip for each marker. They look the location up and then show you where it is on a map. This cemetery has over 80,000 interments and is an active cemetery. The cemetery has instituted a policy to not give out burial information to non-relatives. 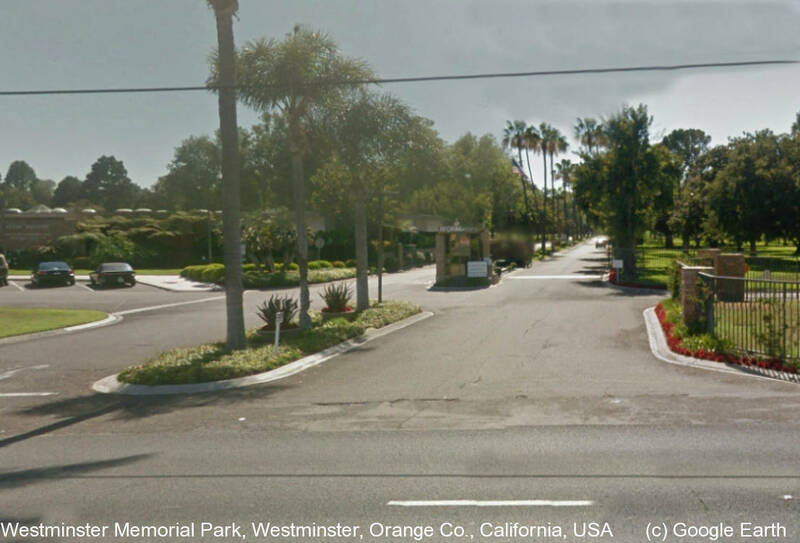 Update, April 2012: This cemetery, Westminster Memorial Park, does not use computers to look up the grave information, they goes by the index cards. They are not friendly to Find A Grave volunteers. If you are making a photo request, it is best for you to call them at 714-893-2421, they will take the names you are requesting, your phone number and your name, and they will call you back in a few days or less to give you the grave location of this person you have requested for photos of the grave maker. Once you get the grave location, please update this memorial page with the grave location, then you can re-submit photo request.